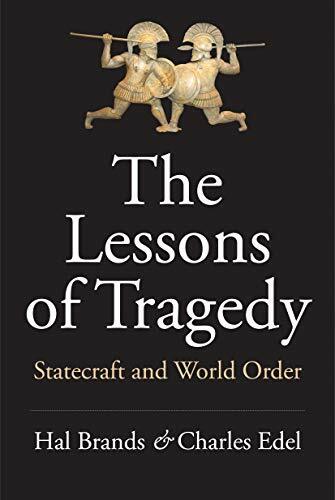 Hal Brands and Charles Edsel, distinguished professors with real world experience in the US Department of State, present what they and others see as lessons drawn from the glory and demise of Athenian power. The Athenians, the authors write, relished drama for its cathartic values but also for its warnings about the vulnerability of human institutions and the dangers of hubris. Contemporary Americans, the authors say, have become complacent about their country’s long reign as the sole superpower. This relatively short survey leaps from the Peloponnesian War to the Thirty Years War to the hot and cold wars of the last hundred years to contemporary faceoffs between the US and China. The major lesson from the past is that the potential for tragedy is always present and often unfolds quickly, catching even astute observers off guard. But Brands and Edsel offer few reasons for optimism. Athenians in the age of Pericles knew the dangers of hubris but succumbed to it anyway, ruining the glory that was theirs in what proved to be futile wars to extend and preserve their empire. If Athenians dared fate and lost, what of contemporary Americans, Chinese, Russians, Iranians and others who believe themselves entitled to glory and greatness? The authors do not cite Graham Allison, Destined for War: Can America and China Escape Thucydides’ Trap? (2017), but their analysis supports Allison’s thesis and its policy concerns. Despite the warnings conveyed to them by the great dramatists such as Aeschylus, Aristophanes, Euripides, and Sophocles, Athenians made self-defeating decisions. They brought tragedy on themselves. What of contemporary Americans—ignorant or skeptical of history, inspired by Captain Marvel, and informed by Facebook—will they be wiser than the Athenians voters, many of whom knew they would soon risk their lives in hand-to-hand combat? Will the 40% of American voters who backed a TV star who claimed he would make America Great Again learn political wisdom from Fox News and social media? The vast majority will never face combat, but their wellbeing may still be harmed by their myopic impulses. The authors base their analysis on hundreds of historical studies and the modern wisdom, such as it may be, of contemporary realists such as Henry Kissinger, Robert Kagan, and Aron Friedberg. But they say little about the American public and its moods as voters veer from Carter to Reagan, Clinton to George W. Bush, and Obama to Trump. Could a successful foreign policy—one that benefits most Americans and a large share of humanity—possibly be built on such shifting sands? Bottom line: This is a book that should be read by all students and citizens concerned with the lessons of history. The deep insights in this book may not be absorbed or followed by American voters or even by many elected representatives. Nonetheless the alert citizen of the US and any concerned member of the human race will learn much from this learned and very readable treatise.